It feels like it's been a long time since I've done a furniture project! At least, one that I'm selling. I saw this dresser and instantly fell in love with the overlay on the drawer. 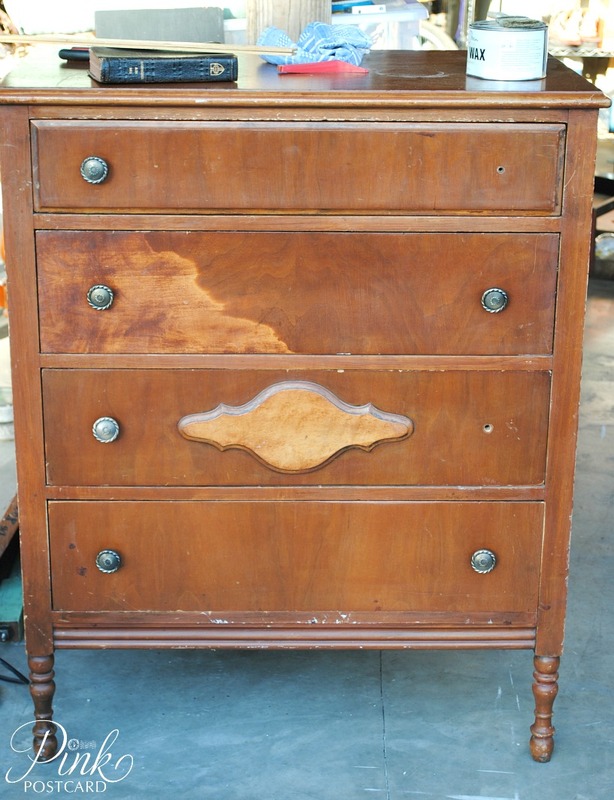 Such pretty lines, and other than the drawers missing the stoppers, it was in really good shape. I painted the body in Annie Sloan's Old White. Initially, I wasn't sure what direction I was going to go with for the design. 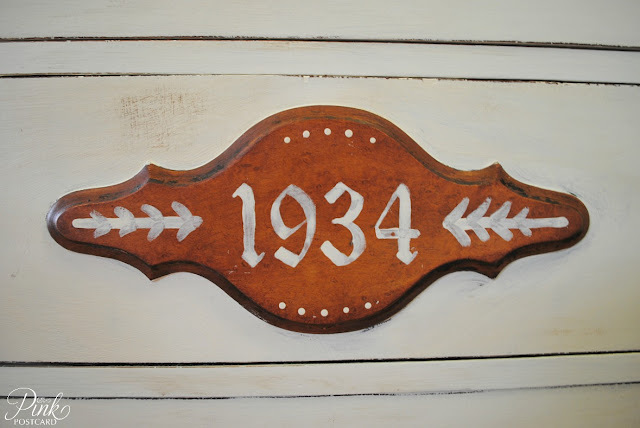 I did find out though how quickly chalk paint dries on a warm day. It kinda tweaked the smooth finish, but when furniture projects give you lemons, make lemonade. The flaws in the paint made for great distressing opportunities! The dark wax enhanced it too, by creating wonderful nooks and crannies for it to hold onto. I had a teensy bit of Antibes green left over from the James coffee table, so a bit of highlighting was used with that. I mixed it with a bit of Old White to mimic the jadeite color. 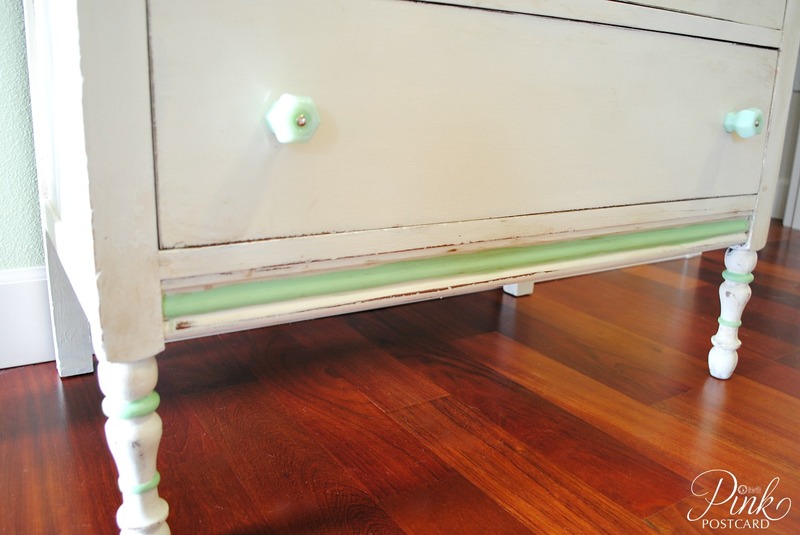 I also added some beautiful jadeite knobs. The overlay was definitely something I wanted to leave in the natural color. But I thought it would be fun to do a little decorative painting on it too. First attempt: wiped off. Ick. Second attempt: eh... closer, but the middle part of the design wasn't cutting it. Third try was a charm! I did a little homage to Miss Mustard Seed and the design she has been using recently. And my love of typography, once again, shows up here. 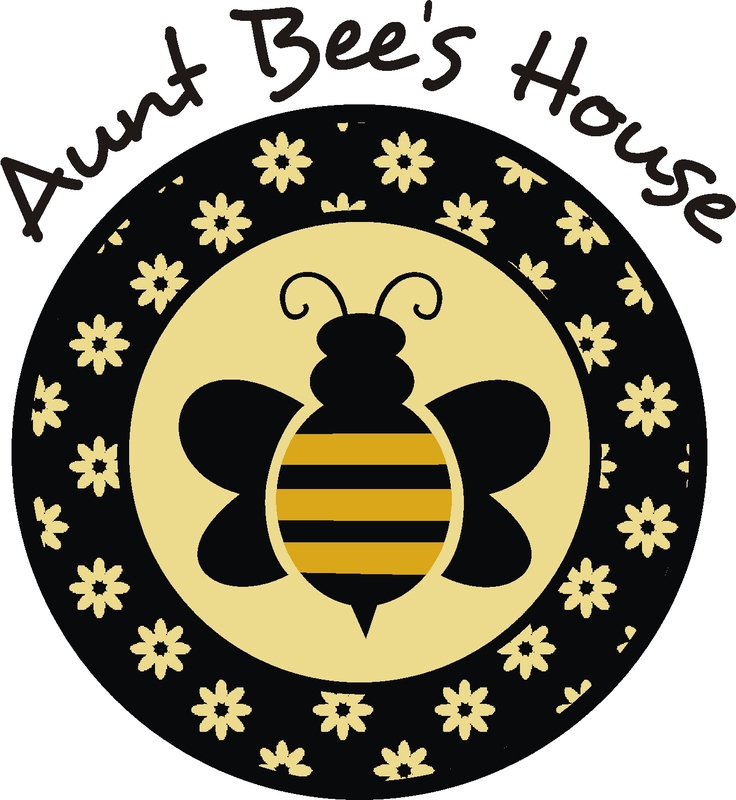 Once I have some room in my space at Aunt Bee's I will be putting The Jade in there. Next week, Jon and I will be going to Maui for a few days to celebrate our 20th anniversary! So, I am trying to line up a few things to be ready while we're gone. Nice makeover Denise. I like the color combo. Oh how pretty! I love the touch of green and the contrast of the overlay! Really like this--cute knobs. Looks great! Great job I too love the color combo. Denise, a beautiful chest, love the writing and the color. I like the contrast of the overlay. Love it...why did you decide on the year 1934? The sweet touches of green really hone in on the depression era aspects of this piece. It was a great call! I love it! Maui sounds like its going to be heavenly...20 yrs! Congrats! turned out great, i can imagine that overlay would be a head scratcher! A beautiful piece of furniture! Love how you painted it and those knobs are great! 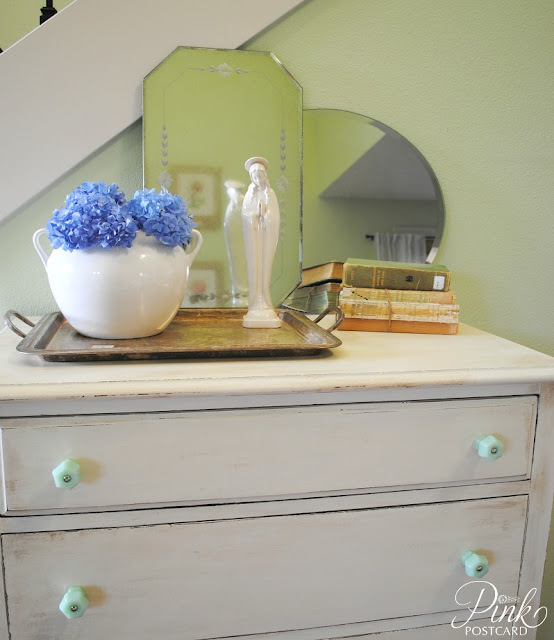 Denise your dresser turned out fab! Thanx for sharing at THT and also love your updated antler! Love the color combination. Such a great dresser! 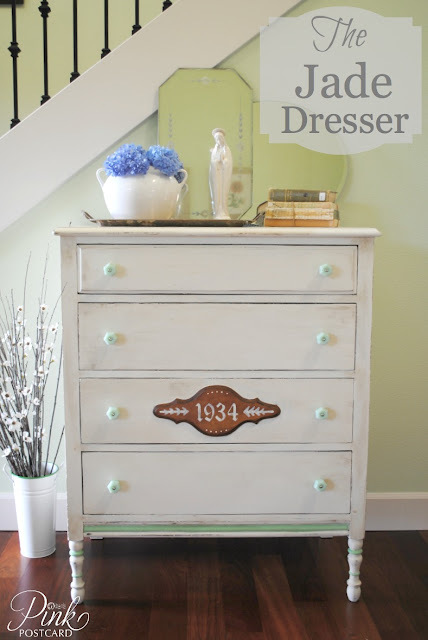 I enjoyed visiting ...Love how the dresser project turned out! I really like the numbers :) Thanks for sharing it! Hello! I featured your dresser in the Pastels edition of my blog series, Get Your Color On! Love the subtle yet colorful touches of this dresser. Great job!